Lawro - Smarter than Goldman Sachs? 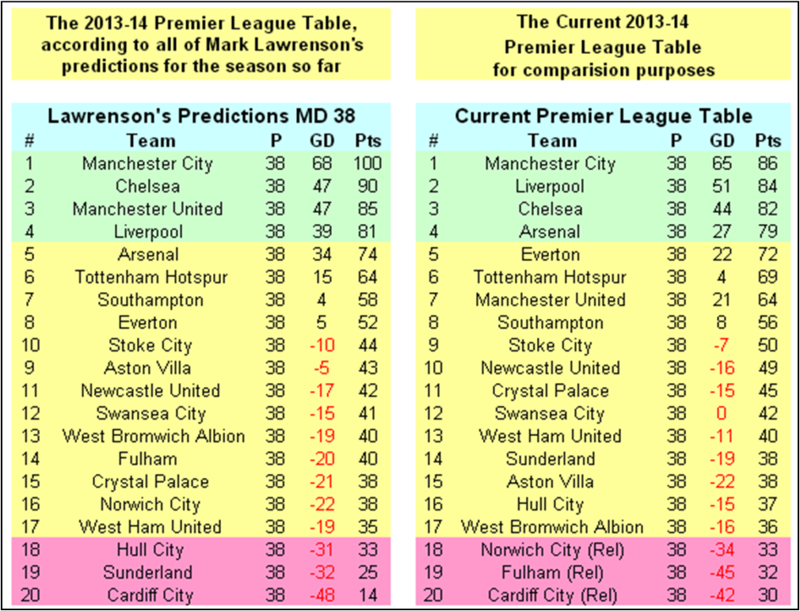 Last year I had a look at how you would fare betting using Mark Lawrenson's predictions where I was surprised to see you'd end up in profit. I also revisited it earlier in the season and found he was still in the black for the 2013/14 season. I feel a bit daft looking at this considering I did the analysis last season and he was comfortably in profit last season as well but I chose to ignore it. There's no fancy stats behind Lawro's predictions, an example of this can be seen in the fact that for 17 of Chelsea's 19 home games Lawro went for a 2-0 win (1 other v Cardiff he pushed the boat out and went for 3-0, with the only points Lawro expected them to drop at home were defeat against Man City). This means that things such as Man Utd's expected position based on his predictions looks a bit daft, but was probably built on the assumption that things would 'eventually' come good for them so he keeps predicting them to win, similarly in almost any individual game you would probably expect Man City to win but that gives you a predicted points total far above what is really likely. It's easy to mock Lawro but he's proved again that he's capable of turning a profit over an extended period of time. 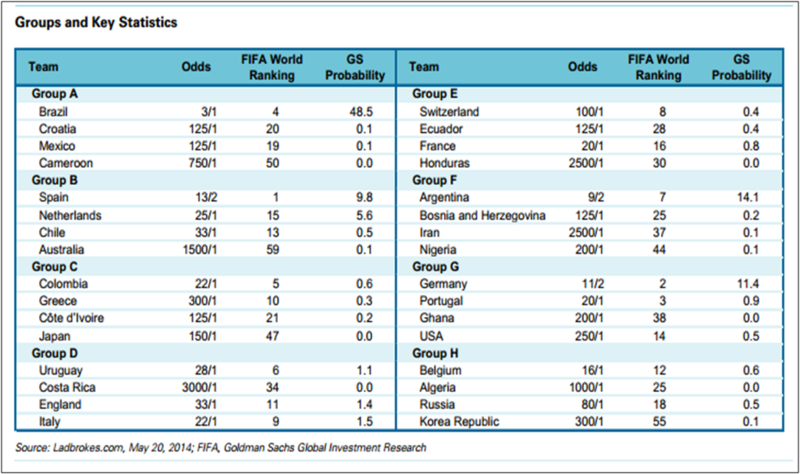 With the World Cup only a few weeks away there have been a rash of pre-tournament predictions including one from Goldman Sachs which gives Brazil a 48.5% chance of winning compared to 25% from the bookies (or even less in reality once margin is taken into effect - total probabilities from bookies odds will be over 100%). 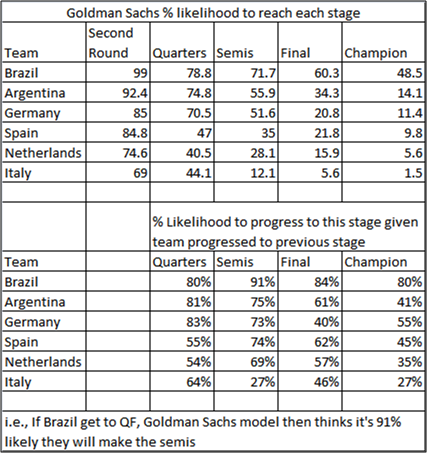 Looking at their % likelihood of getting past each stage, Goldman Sachs have Brazil at 91% likelihood of getting to the semis assuming they get to the quarters and an 80% chance of winning a final if they were to make it that far. Ultimately either through modelling, gut feeling or a mix of the two, profitability comes from finding value that the market hasn't appreciated, but there's no point in a complicated model if what comes out at the end seems unreasonable, although this paragraph towards the end made me laugh considering the amount of description put into the describing the workings behind the model. Pretty much nobody wants Ash to leave and there's a reasonable chance he'd be happy to stay so it would seem to be a fairly simple case of agreeing terms and everyone's happy. In reality, things are far more complicated than that, Ash turns 30 at the start of next season so his next deal (whether a 2 year extension at the Swans or a 3 year deal elsewhere) will take him up to his 33rd birthday so this next deal will probably be the last 'big' one for him. Below are some real back of a fag packet figures but show the kind of things he (and his agent) are likely to be thinking about. Based on little other than speculation and guesswork, I'd imagine Ash is on somewhere around £40k a week and if he had 2+ years left on his contract it'd take offers of at least £10m+ for us to consider selling and I'd consider this his 'market value' if he was tied in to a long term contract. I've seen rumours of Arsenal bidding £3m but at that price there's absolutely no financial point in selling (I'd understand the argument of letting him go for 'cheap' as a thank you for his service if he were looking to drop a couple of divisions to join his boyhood club or something, but not to join one of the richest clubs in the world). There's also been the likes of Napoli mentioned where he could sign a pre-contract in January to start there in the 2015/16 season, for me this is an even bigger worry for Pablo than Ash as obviously it's far easier to imagine a situation where Pablo is happy to run his contract down and go back to Spain than it is for the upheaval of Ash moving to Italy. The new TV deal that kicked in the season just gone meant than Swansea got £74.2m this season vs £47.6m in 2012/13 from Premier League money despite finishing lower in the league, so if income has gone up by 50% it wouldn't be surprising for players to want a rise that reflected this (or have already asked for it at the start of last season), although once you give one player a big rise it risks opening the floodgates and it's not just one player's wages you're increasing. Even forgetting the lure of Champions League football, there is a serious amount of money at play: extend at Swansea on an improved deal and get around £7m+ over the next 3 years or run your contract down, and get a signing on fee and improved wages for following 2 years at a Champions League club (e.g., £2m Swans wages, £2m signing on fee then £3m p.a. wages giving £10m over next 3 years). These figures are nothing but educated guesswork but I'd be surprised if Ash wouldn't be several million pounds better off over the course of the next 3 years by running his contract down. 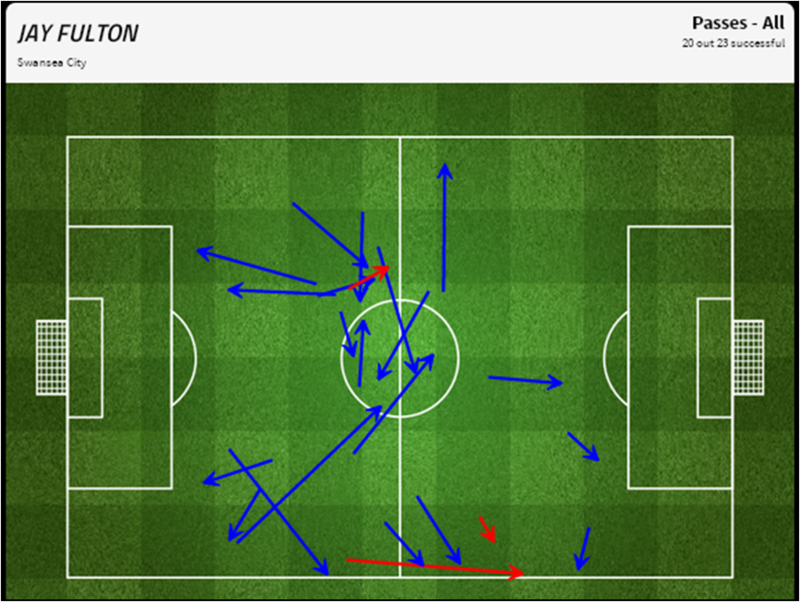 I get the 'if he doesn't wan't to play for us, he can bugger off' argument but I can see why at the very least he's considering his options. Some may say Scott Sinclair faced a similar situation and took the money but I'd argue that in his situation it was a big leap to see himself as a regular first team starter at Man City although I'd imagine to succeed as a footballer you have to have a pretty strong belief in your own ability but I'd expect Ash to challenge for a first team place even if not a guaranteed starter . Situations like these often descend into a game of bluff with accusation and counter accusation with a mixture of rumour, fact and speculation but from a negotiation point of view, every week that goes past strengthens Williams' hand. I hope I'm wrong but given the sums of money involved I don't see anything happening on this before August (if not January). After the drabness of the Southampton game, it was good to see out the season on a high with this game arguably finished after 15 minutes with Swans scoring from their first two shots. 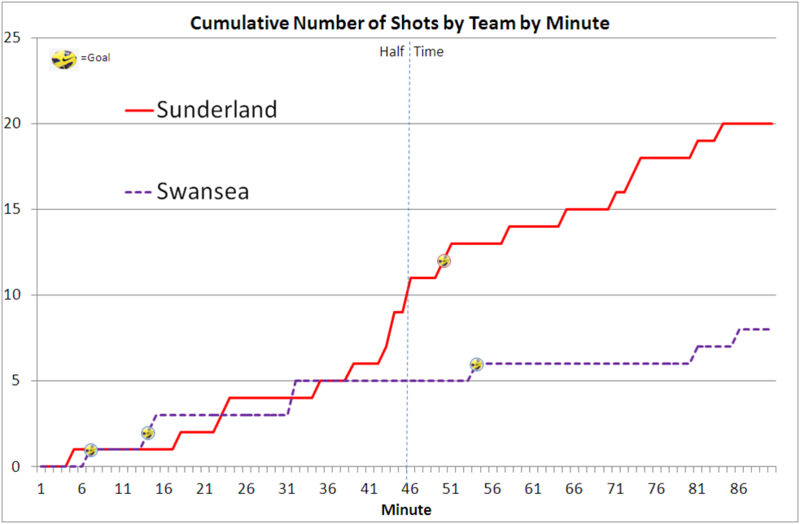 Sunderland might have outshot Swansea 20-8 but the two early goals meant far less of an issue for Swansea to try and force the game. Monk mentioned that 2-0 was a dangerous score but presumably he hasn't read this by Prozone's Omar Chaudhuri which shows that even when a team goes two up with 75 minutes left, they still win 90% of the time. It was good to see Jay Fulton get a start, there's definitely a feeling that Monk is planning on being here for the long term and there's a reasonable chance that there will be an even more integration with other areas and not just the first team. It'd be unfair to overly criticise Laudrup's tenure, but if you're only going to be around for a couple of season then areas beyond the fringes of the first team are less likely to be of concern. If rumoured figures are correct then the estimated £200k for Fulton and £175k for Adam King maybe cost less than the wages for David N'Gog who played a total of 42 league minutes for Swansea. In some respects this is like questioning why you bothered buying home insurance as you're house hasn't burnt down. With injury problems for Michu, if anything had happened to Bony and Ngog hadn't have been bought, then you'd be left with either Emnes up front (which given his form since rejoining wouldn't have been a disaster) or Vazquez, who despite being hugely disappointing only played a total of 412 minutes in the league, of which only 3 minutes were under Monk and 747 minutes overall which in all competitions relates to just over 8 full matches. The season may be over but that means a chance to fill the long few weeks before Bony takes the World Cup by storm with some analysis of the season as a whole without the worry that your stats end up out of date after a couple of days. I'm also going to be talking about the season in general (for all teams not just Swansea) at a 'Football and Data' event in London on May 21st. If you fancy coming along use the code JACK to get a ticket for a fiver.